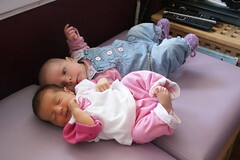 Yesterday mummy took Anna and me to play with another baby. Mummy said she was just little like me but I'm not sure she was quite as big as I am. She was born when I was 6 weeks old. I'm sure we'll have lots of fun together once we get bigger.